Graco’s FastAction Fold Jogger Click Connect is the ultimate crossover baby stroller, combining all the comfort and ease and convenience features of a standard infant stroller with the performance and maneuverability of an all-terrain jogger. 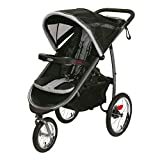 This baby stroller is loaded with innovative features like the one-second, one-hand FastAction fold bringing the best in convenience to a jogger. Click Connect technology lets for a one-step, secure connection of toddler car seat to baby stroller.